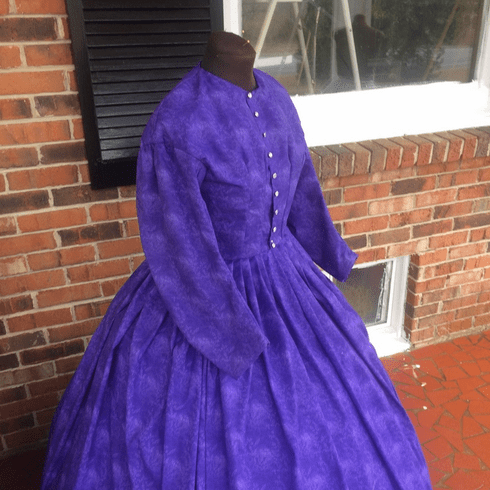 This is a 2 piece Civil War dress/gown. It has basic styling that can be dressed up with collars, cuffs, or a belt. It can also be dressed down with an apron to look more like a work gown. It is made of 100% cotton, quilters fabric. It is a beautiful purple russet with a vine pattern. The bodice has a lovely jewel neckline with dropped shoulders and 2 piece coat styled sleeves. It 4 darts in front with princess seams in the back, for the perfect fit. It is fully lined and closes down the front with wooden buttons. The sleeves and hemline have been hand finished. The skirt is a extra full 180 inches around and has been hand hemmed to approimately 44 inches. It has been handpleated onto a matching waistband and closes in the back with hooks and eyes. The gown, itself, measures waist of 28 inches with a bust of 36 inches .